Many users commented that the Nike Zoom Fly offered fast and efficient performances on the road. A lot of consumers liked the cushioning system of this running shoe, stating that it offered generous cushioning throughout their runs. Most runners were very satisfied with the sock-like fit of the upper unit, emphasizing that the coverage was smooth and non-irritating. The reviewers were happy about the lightweight nature of the components as they apparently improved the efficiency of their gaits. A few users commended the high-quality construction of this shoe since it held up well against abrasion and other aberrations, even after many miles of running. Several runners commented that the midsole was responsive yet plush and that the mixture of those elements led them to feel well-supported. The aesthetics of this product were lauded for being street-ready and colorful. A majority of consumers stated that they were comfortable wearing this running shoe during long races like a half-Marathon or a full Marathon. A marathon-runner mentioned that after running in the Nike Zoom Fly, he felt no leg fatigue or any ache whatsoever. The traction capacity of the outsole unit was welcomed by several testers who stated that it allowed them to swerve and halt with precision and grace. A few testers returned their shoes back since they found the forefoot to be too roomy and loose. Several people mentioned that little rocks had the tendency to get trapped in the outsole tread, causing some discomfort and unbalanced performance. Another tester thought that the shoe was not durable enough; he reported that the sole unit started to wear off after only several miles of running. Some individuals thought that the Nike Zoom Fly’s original price was a tad expensive. A couple of runners claimed that the sizing scheme was half-a-size bigger than their usual fare. With its fast and efficient performance, sleek and stylish looks, and plush yet responsive cushioning, the Nike Zoom Fly outperformed its many competitors in the market and certainly raised the bar for running shoes from across all brand. Also, its outstanding features apparently made it a worthwhile choice for most runners looking for a durable pair of neutral road running shoes to accompany them during their activities on the asphalt. On the other hand, the looseness of the forefoot section, the rock-magnet outsole, the easily erased rubber, and the high price were elements that didn’t gel with several consumers. We all heard of this shoe right? It has been the talk in the running community over the past year. There have been countless comments, articles, and reviews written about it. Some people love them, some people hate them, and some just don't believe the hype. This review is unlike any you have read. I am not going into details and in-depth breakdown. This review is the highlights and my experience. I won't bore you with more than that. So, let's jump in. These shoes are different than what you are used to! There is no other shoe like this. I have never worn one or heard talks of others out there. So when you put these things on for the first time, you will most certainly be a little confused about why people love these. Push through it! Break them in, run in them and after 20-30 miles you will be pretty excited about them. I personally almost sent them back 3x. I'm glad I didn't. Yup! When you wear these, you will just want to run fast. I personally cannot run slow in them, and when I do, they feel very sloppy. From my experience, anything less than 8:00/mile pace is too slow for this shoe. So, if you are a slow, plodding runner or you're looking for a slow paced workout shoe, this is not it. Nope! I saw that some people use them this way, but I believe you are better served to use trainers for training and racing shoes for racing. Race in them. You can, however, cycle them in your shoe lineup for some fast pace training sessions. Sorry, they're not for everyone. Due to lack of arch support, the narrow width of the shoe and the height of midsole, this shoe is an injury waiting to happen for those of you who overpronate (fall inwards) with running. Trust me. I work with runners often in my Physical Therapy clinic and have seen the result of improper footwear for an individual. Don't make an immediate decision on these. Wear them around for a bit. Run in them about 20 miles. You have to get used to these and takes longer than other shoes. If no pain and just awkward, be patient. You will not regret it. One of my issues. Anything other than pavement, you will regret them. I wore these for a half marathon with some gravel trail, and they were terrible. The traction just is not made for anything but roads. You will feel an immediate loss of traction if on any other surface. I love a very snug shoe, but these are a bit too snug at times. I recommend going up a ½ size with these. I wore these for my last marathon, and by the end, my poor toes were a bloody mess. I just have developed a love for these things. They are wonderful for half - full marathon distances that are road only. I will never race in any other shoe for long distance races. They are fast, responsive, cushiony and most importantly get better with miles. So these things helped me set PRs in the ½ marathon and marathon. Now, other factors helped me achieve these better times, but I really believe they added to it as well. With these on, I ran the same marathon for the second consecutive year. I was able to take 20 minutes off my time and the race felt better. I did not have as much leg fatigue and stayed in rhythm a lot better. Trust me. These shoes help your run. The energy return is awesome, and they bring forth less strain on the legs. So there you have it. I hope this helps you as you determine if these are appropriate for you. I do believe that these overall are the best long distance race shoes (haven’t tried the Vaporfly, but the price is absurd) as long as you are appropriate for them. As with all shoes, these are a tool. Use them appropriately, and you will love them. It has an offset of 10mm (33mm heel, 23mm forefoot) with a weight of 248grams (US Size 9). The Zoom Fly uses an engineered mesh with a few cut-outs to allow for breathability. It features a thin and soft fabric layer attached to the mesh for a sock-like fit that conforms to the feet of the individual. I found that breathability was not an issue for me. No rubbing or hot spots were found during the use of the shoe. The upper is certainly not the best (check out the under armour hovr) but performs decently. The Dynamic Flywire technology is utilized to allow a more custom and snug fit. This locked down my feet considerably well and provided minimal support, though I could feel the flywire ever so slightly when I wore thin or no socks. Fortunately, the flywire did not dig into my skin. The ankle collar is padded quite thickly. Frankly, the padding could be cut down to save weight while retaining comfort. The heel counter is located internally to provided support and heel movement. This worked fairly well for me but adds weight to the shoe. The tongue is a very thin layer of an asymmetrical shape. I initially thought that the tongue would pose a problem and cause some rubbing due to the fact that it wraps the foot more than a traditional tongue. I found that none of these problems occurred. The tongue pleasantly surprised me; It provided a more secure fit while being decently protective. However, I started to feel a bit of lacing pressure when I tightened my shoes. The Zoom Fly uses thin and flat laces that provide a better lockdown than rounded ones. The laces are not stretchy. This depends on the distance and thickness of socks you wear. If you run 10km and below/ your feet does not swell as much/wear thin socks, then go true to size. If you are running half to full marathons/ your feet swell quite a lot/wearing thick socks, then go up half a size. As the Vaporfly 4%, the midsole uses Lunarlon instead of ZoomX. Lunarlon has been a standard material used in many Nike shoes. Lunarlon does not last for very long. After a 10km run in the Zoom Fly, creases are starting to appear in the midsole. In the Zoom Fly, Lunarlon just felt lackluster. Perhaps it could be due to the carbon-infused nylon plate that runs the entire length of the shoe. This brings me to the point of the plate. Yes, the plate allows for a smooth transition from heel- to- toe. However, the stiffness of the plate makes it such that the effects will only be felt when landing on the midfoot or further back. Landing on the forefoot creates a slappy and unpleasant sensation unless running at very high speeds. Take for example the pebax plate used in the Streak 6. The plate is too very responsive but allows for some flex to create a very snappy ride that feels like it returns energy back with every stride. 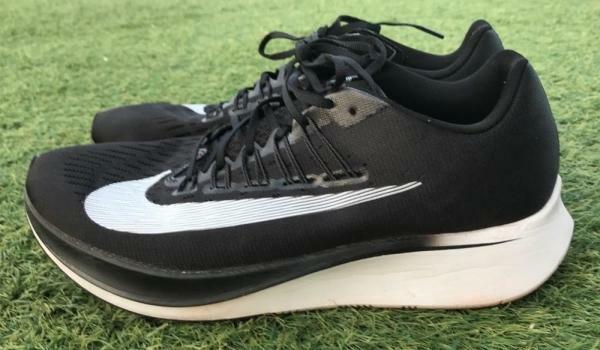 In the case of the Zoom Fly, the plate is completely unbendable that unless you are running fast, the plate makes it feel like the shoe is working against the user, which defeats the purpose of the shoe. At faster speeds of below 4:00min/km, the plate then allows a smooth gait cycle when landing on the forefoot. This brings up another problem: weight. The shoes' weight is in the range of 240+ grams. For a race shoe, that is just too heavy for me to use, especially in shorter races such as 5-10km. The Zoom fly is marketed to be a versatile shoe for any speeds but feels to me like it fails at all levels. All in all, the ride is smooth and cushioned when certain conditions are met. The sock liner is thin with no support. This is pretty much a standard piece with thin layers of foam to provide the initial comfort when wearing the shoe. This provides little to change the feel of the shoe. The Outsole consists of a carbon rubber patch that covers the entire forefoot and several areas of the heel. The midfoot region is completely exposed. The outsole patterns provide an outstanding grip on both wet and dry surfaces. I ran in this shoe on the track and roads after a thunderstorm and hardly slipped. The Carbon rubber patches look durable, roughly 100km in and there’s hardly any wear. The exposed regions of the outsole, however, are showing signs of minor tearing, especially on the lateral edge of the heel. I expect the outsole to hold up longer than the lunarlon midsole. The Zoom Fly is best used for faster paced training such as tempo workouts or races up to full marathons. This depends on your running style. Both are cushioned, with the freedom being bouncier and livelier. The smoothness of transition from heel to toe really depends on your running style. If you land more towards your forefoot in the zoom fly, it can feel slappy to run in. The freedom, on the other hand, has a smooth transition no matter how you land in it. The zoom fly’s 10mm drop is easier on the Achilles compared to 4mm of the freedom. Both absorb shock quite effectively. The Zoom Fly is geared more towards faster running while the Dynaflyte is more versatile. Anything slower than a 4:30min/km on the zoom fly and my forefoot starts to fatigue due to the toes trying to flex. The absence of the extremely stiff plate on the Dynaflyte allows for running at easier paces. The Zante is firmer yet more versatile. Again, this depends on your needs. Both provide smooth transitions. 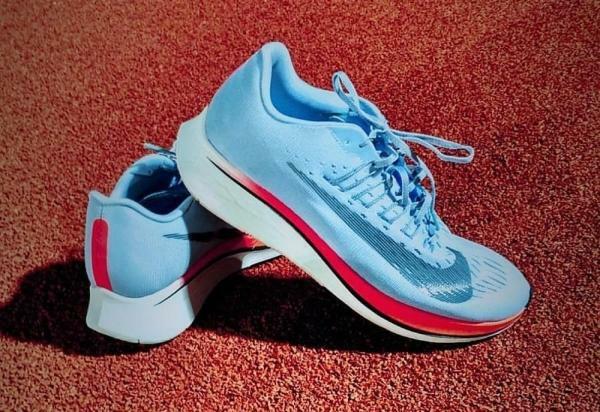 Forefoot strikers would not enjoy the zoom fly as much and would be better off with the Zante. The lightweight race-trainer with decent cushioning and fast transitions (with the right running gait). However, it fails to live up to the hype. The Zoom fly and the Vaporfly 4% are worlds apart. If the shoe came out on separate dates with the Vaporfly, the shoe may still be worth a shot. Overall, the Zoom fly is an overly hyped and cleverly marketed shoe that disappoints. 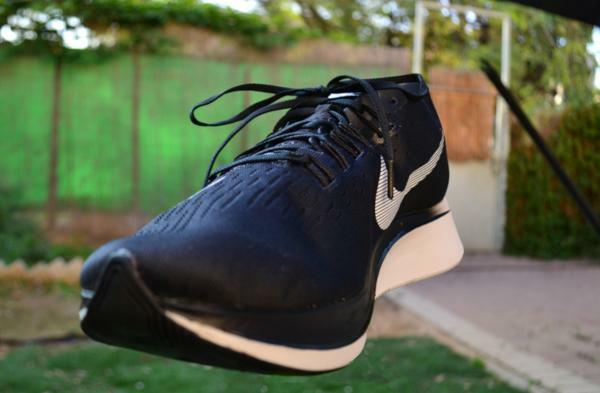 The Vaporfly 4% that is still not very affordable. Being based on such a hyped up shoe, I expect the Zoom Fly to be better but by no means is it a bad shoe. From what I have experienced from running in this shoe, the shoe is not meant for everybody. The upper on the Zoom Fly is the same engineered mesh used on many of the other Nike running shoes. The material used is quite durable from past experience and yet does not compromise on weight, comfort, and breathability. One other thing I enjoy about the upper is that it allows my foot to move naturally due to the lack of overlays. Also, the holes in the upper make the shoe extremely breathable which is something that I feel many runners would appreciate especially those who run in hot and humid conditions. It helped my feet to feel fresh as I was running. The Zoom Fly is a very comfortable shoe which is expected from Nike. The insole and upper does not rub against the skin which helps to reduce the occurrence of hotspots and abrasion. The only time I had a hotspot was during the break-in period but after that, I have not experienced such an issue. To help the shoe have a more secure fit, flywire is added. This helps to give it a good lockdown and help to stop my foot from moving too much inside the shoe. I feel that the ride on the shoe has garnered mixed responses from runners. Some runners think that the ride feels amazing while others feel that the shoe is sloppy at slower paces. From what I have experienced, I feel that the ride of the shoe is very similar to that of the Clifton. The heel to toe transition feels the same due to how similar the two shoes are shaped. Running in the shoe, I feel that the shoe just wants me to run fast. During my time running in the shoe, I feel that the shoe just wants me to be on my toes as my feet constantly rolls forward. Also, the excessively thick lunaron midsole provides a very cushioned yet responsive ride. Having ran in the Nike Lunartempo which is a shoe that also has a lunaron midsole, I feel that the ride is more forgiving on the Zoom fly and yet the Zoom Fly is still stiffer with the inclusion of a carbon fiber plate. The result of this is a shoe that feels very very quick. As a runner, I put functionality over looks but I have to commend Nike for making a Hokaish looking shoe look good. One thing Nike has really excelled in is making very good looking products and the Zoom Fly is no exception. Compared to shoes that have a similar look such as the Clifton, the Zoom Fly looks stunning. The many colorways the shoe comes in gives runners gives runners a choice. Also, the amount of detail on the shoe is one of the other things I like about the shoe. From the prints on the tongue to the area where I can write the time of the race I used the shoe in at the heel section, the attention to detail on this shoe impresses me. Strategic placement of vulcanized rubber added with the excellent material used on the shoe ensures that the shoe has a long lifespan. The exposed areas of the sole did experience some wear. Due to the shape of the shoe, runners will be on the forefoot for the majority of the time they are running in the shoe, this is where most of the wear in the rubber is located. After running on wet and dry surfaces in this shoe, I am happy to say that this shoe performs very well on them. There hasn’t been an instance where I had to worry about running on a wet surface in this shoe. Although this shoe is a consumer-oriented version of the very pricey Vaporfly, it is still pushing the upper limit of what an average consumer would be willing to fork out for a racer. 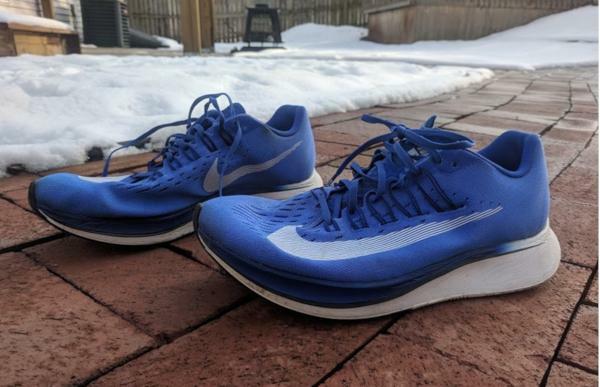 For a runner who wishes to get this shoe, it is very good to note that there are many other shoes that are excellent racers and are much cheaper than the Zoom Fly. I feel that for all the hype this shoe has caused and the price tag, this shoe is still not very consumer friendly. I am well aware of the fact that there are features in the shoe such as the carbon fiber plate embedded in the midsole material but I still feel that this shoe is not deserving of the $150 price tag it comes with. Being marketed as a racer, I expected the shoe to be much lighter. Coming in at 248g, it is much heavier than what I expect a racer to weigh. Other racers from Nike such as the Streak 6 comes in at 181g and I feel it performs as well as the Zoom Fly. The laces on the zoom fly are very annoying. They always come undone if I do not double knot them and they are very hard to undo. Being someone who does a lot of their training on grass and synthetic turf, I constantly find debris being trapped in the outsole material. It isn’t a big problem but it is one of my many pet peeves. For people who are finding a shoe that can do everything, the Zoom Fly is not the shoe for you. With its unique geometry and thick midsole, this shoe is not able to do much else besides walking and running. Doing any kind of sport besides running is quite sketchy in this shoe as the high stack height puts the user at risk of falling or twisting an ankle making this shoe very unversatile. Honestly, the hype surrounding the shoe does not live up to the way it performs but still, this shoe is a good shoe. Taking a new approach to the way they make their racers, the Zoom Fly is a decent racer that can be better. After using it for long runs and workouts, one thing I noticed is how much the shoe wants me to run fast. The carbon fiber plate in the midsole added with the responsive lunaron midsole material makes the shoe very fast. Running in it during faster workouts, I can really feel how the shoe wants me to fall forward. One issue that the shoe has is that it feels a little sloppy at slower paces which is kind of a bummer as the Zoom Fly is seriously amazing at a quicker pace. Compared to other racers such as the Nike Streak 6 and Hoka One One Tracer, the addition of the extra midsole material along with the carbon fiber plate makes this shoe one of the most efficient racers I have run in. Another benefit the extra cushioning brings is that I feel little to no feet fatigue when running in the shoe. The Zoom Fly is a good attempt by Nike to bring a shoe meant for good runners to consumers. However, it is important to note that this shoe is not meant for everyone. The hype surrounding the shoe is simply too much for the Zoom Fly to live up to so one should not feel short-changed when the shoe does not live up to their expectations; perhaps only the Vaporfly will be able to live up to the hype. For runners who are looking for a racer, similar cheaper alternatives such as the Hoka One One Clifton 4 and the Nike Zoom Elite 9 exist. By no means it is a bad shoe but due to its steep pricing and lack of versatility, the Zoom Fly has failed to live up to its hype. Does the Zoom Fly by Nike really fly? I was looking for a shoe to replace my Nike Zoom Elite 8 for my faster workouts. A friend sent me a link with these shoes on sale, so this is how they ended up in my rotation. I was looking forward to trying them at some fast paces and took them on a 5x1k interval workout. From there, they accompany me for those interval runs and fast tempo runs, and here are my thoughts. Right off the bat, I can say that the feel of the ride is something new to me. I have run in rigid running flats for short 5k races, but none of them felt quite like this pair. The combination of Lunarlon cushioning system together with the tough plate embedded within gives a unique feel, which I will discuss further. The upper is made of a two-layer engineered mesh. The internal one is made of a denser thin, soft sock-like material, while the external is made of a more ventilated and a bit rougher material. Along both, lateral and medial sides run five pairs of “flywire” cables that compensate for the give of the thin mesh to get a solid foot lock-down. Around the lace-holes, there seems to be a welded material to get a solid lacing and ensure the durability of the upper. A sandwich midsole consists of a tough plate, made from a combination of nylon and carbon fiber in between two layers of the Lunarlon. Nothing minimalistic about this midsole, not the engineering nor the stack height. The outsole is made of about 50% blown rubber around the heel area and under the toe box area, and another 50% of Lunarlon under the midfoot area. The rubber is great for traction and durability over areas that tend to get a lot of ground contact. Not covering the whole outsole with rubber helps keep weight down especially when the Lunarlon has shown in the past that it has no problem handling a lot of beating even when used bare on road (like the LunarEpic that has no durability issues at all while having no rubber outsole). The shoe is very well ventilated, and the “flywire” together with the mesh makes a great team on keeping a secure hold and not chocking the foot. The foot roll along the gait cycle is unique not only because of how rigid the embedded plate is, but I think mainly because of it’s the spoon-like shape. The plate is placed diagonally, from the upper part of the midsole in the rear foot to the lower portion of the midsole in the forefoot. This gives the feeling that the second you land on your mid\forefoot, it forces you to roll forward, acting as a catapult and not allowing your heel to contact the ground. The outstanding thing is that all this happens in the shoe effortlessly, making running slow in these a hard task. Zero ground feel happens because of the carbon infused nylon plate. This might not be good nor bad, just something you should know. I tried heel striking in the Zoom Fly, and I have to say it made the ride not as smooth and flowing. As a heel striker, I would take that in mind and take them for a short run if possible before buying. Because it takes over the handling foot stiffness, small intrinsic foot muscles no longer have to work which will probably a cause to weaken performance. This is why I will not substitute all my softer and more flexible running shoes to plate embedded shoes. I recommend these shoes to anyone looking to upgrade their speed work game. Also, I would definitely wouldn’t use these as my main volume running shoes, but have the best time running fast in them. The High Abrasion rubber and the Foam rubber along with the specifically shaped lugs placed at strategic locations on the outsole give an optimal combination of excellent traction, high resistance to abrasion and enhanced flexibility. These technologies, also being very durable, make sure the shoe keeps on performing very well for much longer durations of time. In the midsole, the LunarIon foam and the full-length Carbon Infused Nylon plate maintain an environment of optimal cushioning and efficient responsiveness for the runner. The material is soft and it provides the needed support underfoot. The Engineered Mesh with perforations at strategic locations ensures a fully ventilated environment inside the shoe for the runner. It also provides a snug and secure fit with the help of Dynamic Flywire technology. The Nike Zoom Fly boasts the feature of Internal Heel Counter for keeping the user’s heel in its proper position while running. This saves the runner from uncomfortable sliding or rubbing of feet against the shoe. The Nike Zoom Fly is most suitable for neutral runners with feet that are neither too wide nor too narrow since the shoe comes in the standard medium width of D for men and B for women, respectively. The shoe has a standard running length and for most individuals, it fits true to size. The heel part of the Nike Zoom Fly’s outsole uses a rubber compound that is highly resistant to abrasion. Its goal is to protect the foam midsole from the damaging nature of the roads. It also doles out surface traction, which is an essential aspect of running shoes. Foam rubber is placed in the forefoot section of the external pad. This material has a spongy construction which allows it to provide an extra spring to each step. It is flexible and traction-ready, as well. The shoe is further improved by a system of patterns at specific locations on the outsole for optimal performance and a firm grip on dry and wet surfaces. Lunarlon is the primary technology that’s used in the Nike Zoom Fly. This full-length cushioning system is comprised of a carrier foam that cradles a soft material in its center. The purpose of the former is to provide long-lasting structure and volume to the underfoot experience while the latter is tasked with ensuring a responsive and highly energized performance. A carbon-infused nylon plate is implanted into the entire length of the foam. This add-on has the purpose of acting as a propelling component that energizes the foot as it lifts off the ground. It bends with the foot then springs back into place during the end of the motion, ensuring a burst of propulsion that benefits the action. An insole is placed on top of the primary cushioning unit. This extra layer is made to provide additional support to the underside of the foot. It can be removed or replaced with a new one. A one-piece engineered mesh is used for the upper unit of the Nike Zoom Fly. This technology resembles traditional cloth, and it has the same qualities, as well. It is lightweight and flexible, so it is able to provide a hug that is akin to wearing a sock. Also, it is form-accommodating and breathable, so it allows the foot to stay relaxed and dry during the running session. An internal heel counter graces the back portion of this running shoe. This feature is meant to hold the foot in place, saving it from quivering at any point of the performance. It also makes sure to prevent the foot from exiting the interior chamber unexpectedly, thereby improving confidence and a well-realized heel-to-toe transition. A traditional lacing system with semi-flat laces and discreet eyelets permits the wearer to manipulate the level of security for the foot, thereby acquiring a customized in-shoe wrap. The Dynamic Flywire technology is comprised of cables that poke out of the façade’s midfoot section. These wires connect to the shoelaces, adjusting in tandem with the tightening or loosening of the fit. Their coverage of the midfoot section ensures a snug embrace that is supportive of the delicate arch. The lightly padded tongue and collar are elements that cushion the instep, the ankles, and the Achilles tendon. Having an upper that offers comfort may enhance the performance, especially when tackling extended runs and contests.